Money has become the issue standing between the NHL and the 2018 Winter Olympics in South Korea. 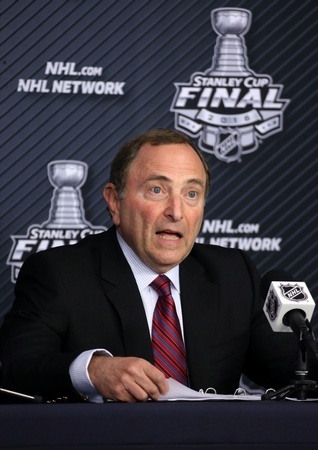 National Hockey League commissioner Gary Bettman held his annual state of the league address at Game One of the Stanley Cup Final and noted that the NHL and the NHLPA have some decisions to make regarding participation in the Olympics. This all hinges on IIHF president Rene Fasel’s recent revelation that the IOC will not be ponying up the green for costs associated with bringing NHL players to the event. These costs are mainly related to transportation and insurance, something the IOC has actually been covering for the past five Olympic events. To hear Bettman tell it, IOC president Thomas Bach doesn’t “believe” in “special subsidies” for any Olympic sport and therefore doesn’t believe in paying costs that have been traditionally covered. Bach took over the IOC presidency just ahead of the 2014 Olympics. The NHL will be making their decision regarding participation in the Olympics sometime after the September World Cup of Hockey and, if Bettman’s address is any indication, it doesn’t look good. And without a doubt, it’s hard to justify the NHL interrupting their regular season to play in a non-traditional hockey market. And it’s harder to justify that without the subsidies that would traditionally alleviate the expense of playing in the Olympics. The commissioner also addressed the issue of league expansion, noting that the NHL’s Board of Governors is set to meet ahead of the June 22 NHL Awards in Las Vegas. This suggests a more concrete date to a decision regarding expansion teams in Las Vegas and Quebec City, with the earliest date of expected expansion set to the 2017-2018 season.